Often misunderstood, Medicare’s three-day payment window has reemerged as a topic of conversation in coding circles thanks to a recent CMS clarification. Many hospital coding and billing departments continue to struggle with the nearly 20-year-old definition of “other services” as related to Medicare’s so-called 72-hour rule—more accurately defined as the three-day payment window. The resulting misapplication forces many facilities to leave reimbursement dollars on the table rather than risk demands for repayment and potential financial penalties. Part of the Centers for Medicare & Medicaid Services’ (CMS) prospective payment system, the rule as originally issued requires hospitals to bundle any charges for outpatient diagnostic or other services related to a patient’s admission that are provided during the three-day period preceding admission under the inpatient claim. However, the definition of other services remained an ongoing point of contention, leading to a 2011 CMS clarification on how the rule should be applied to certain outpatient services. Specifically, the agency defined other services to include any outpatient service that is clinically associated with the reason for admission. Further, any outpatient nondiagnostic services provided within the three-day time frame would be considered admission related unless the hospital verifies they are clinically distinct and unrelated. That is not all the rule change has accomplished; it has also brought compliance concerns to the forefront. “The increased conversation the rule change has created is making people realize how misunderstood the rule has been for quite some time,” says Susan Wallace, MEd, RHIA, CCS, CDIP, CCDS, director of compliance and an inpatient consultant with Administrative Consultant Service. When the rule was first issued, many hospitals restructured billing systems to bundle all outpatient preadmission services performed within three days of admission, an approach that led to both unintentional violations and lost reimbursements. Others opted to stop billing any outpatient services provided within three days of admission separate from the inpatient claim, even in cases where doing so was justified. In issuing its clarification, the CMS sought to not only clear up the confusion surrounding the definition of other services but also to expand the scope of the rule to include all outpatient nondiagnostic services rendered within the three-day window unless the hospital attests that specific nondiagnostic outpatient services are clinically distinct and unrelated to the hospital claim. In particular, the CMS emphasized that the rule also applies to services rendered at physician clinics or practices that are wholly owned or operated by a hospital. Thus, the technical portion of preadmission services must be included on the inpatient bill, although the professional fees may continue to be billed separately. Tiffany Hetland, an associate with Husch Blackwell, notes that this represents a significant change in the rule’s application and is likely to create major administrative challenges for hospitals that own or operate outpatient ambulatory clinics. “These providers will now be required to develop and implement effective communication and tracking processes to ensure that all applicable outpatient services furnished at these clinical sites are rolled into the inpatient claim appropriately,” she says. Miller, who concurs that the clarification has created new compliance challenges, suggests that hospital employment of physicians and the acquisition of physician practices by hospitals and health systems pose the most significant hurdles. This is because these activities typically result in remote locations that, while wholly owned or operated by the hospital, utilize different billing systems with no centralized way to identify patients whose care may fall under the three-day rule. “Identifying the technical component of the service as well as the nondiagnostic services to be bundled into the inpatient claim is difficult in this scenario,” she says. Finding a way to avoid noncompliance is crucial. Just as the scope of the rule has expanded so has the risk. For instance, Miller points to activities, such as the Recovery Audit Contractor (RAC) program, that are enabling the CMS to recover overpayments in certain regions, efforts that will likely be expanded as target lists are updated. Also, the Office of Inspector General is mining data from a national claims database to match claims from Medicare Parts A, B, and C to identify unbundled claims that result in overpayments. Wallace identifies three specific billing risks confronting hospitals in terms of compliance with the three-day rule. The first is incorrect bundling of an outpatient surgery with an inpatient claim, resulting in a Medicare severity (MS)-DRG overpayment. She notes that many but not all of these fall into the MS-DRG 981 to 989 category where the surgical procedure is unrelated to the principal diagnosis. “These are RAC/MAC [Medicare administrative contractor] targets, and the likelihood of review is high and accuracy is important,” she says. Second is incorrect bundling of unrelated outpatient therapeutic services with an inpatient claim. While the results of this action may not impact MS-DRG payment, a hospital has nonetheless “lost legitimate outpatient revenue that should have been billed separately,” Wallace says. Third is incorrect coding assignment that results when the inpatient and outpatient claims are combined. For example, an outpatient procedure is coded in CPT and is subsequently “cross-walked” to an incorrect ICD-9-CM procedure code so the claim can be filed. The CMS also recommends instituting policies under which claims for services provided by any hospital-controlled physician practice are held for at least three days. This way, should a patient be admitted 72 hours after outpatient services are provided, the modifier can be added to the claim. In fact, because of the complexity involved in compliance, much of the focus should be on strategies related to wholly owned or operated physician practices or other entities. Hetland suggests implementing processes to identify and isolate outpatient services that are related to a subsequent inpatient admission, which may include analyzing relevant reports on a weekly basis or identifying appropriate scrubbing tools. “Clinics and practices wholly owned or operated by a hospital should also collaborate with the hospital to establish an effective communication system to ensure applicable outpatient services can be identified, tracked, and billed appropriately,” she says. In general, a smart first step is to establish processes that ensure cases subject to the three-day rule are properly identified. This requires more than simply dictating that all claims within a three-day payment window should be combined, a strategy that will ultimately create more problems than it resolves, Wallace says. “It is fine to automatically combine outpatient claims that contain only diagnostic services, but those with nondiagnostic/therapeutic services, other than ambulance or maintenance renal dialysis services, should be flagged for review,” she says, adding that it is also important to pinpoint who manages that review. “Who is going to determine whether the cases are ‘clinically related’? Ultimately, some of those cases may require referral back to the physician for clarification. The initial review might be performed by someone from quality or clinical documentation improvement, for example,” she says. Wallace recommends conducting prebilling reviews of any cases assigned to MS-DRG 981 to 989 to ensure inpatient and outpatient information is correctly combined and sequenced. Also, any time the MS-DRG on a claim does not match the MS-DRG that was initially coded, the case should be flagged for referral back to coding for resolution. Close attention should also be paid to admissions procedures. Because the date and time of admission drives much of the process, it is especially important that this information be captured accurately at the outset. “Obviously, documentation of the reason for the patient’s inpatient admission determines the principal diagnosis and MS-DRG payment, but it is also an important factor in determining whether the conditions are related. Without a clear statement as to why the patient became an inpatient, the risk of improper payment is greater,” Wallace says. Miller emphasizes that simply having policies in place is not enough; they must be communicated and enforced across the enterprise. Further, everyone in the billing and coding process, including admission clerks, registrars, and even clinical staff, should be educated on the rules and procedures. She also recommends deploying a tracking and audit mechanism, even if it is manual, in both inpatient and outpatient departments to aid the coding and billing staff with compliance. 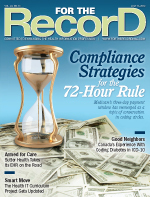 “Communication and collaboration as the patient moves through the system from outpatient to inpatient, along with a centralized repository for information and procedures to monitor and audit the information for compliance with the three-day rule, will assist in identifying claims requiring bundling as well as those that can be billed separately for those nondiagnostic services that are not clinically related,” Miller says. Finally, it is important not to overlook the attestation process, which allows hospitals to claim specific nondiagnostic outpatient services are clinically distinct and unrelated to the hospital claim. “To make such an attestation, the hospital must add condition code 51 to the preadmission claim and ensure adequate supporting documentation is maintained in the patient’s file,” Turner says. Ultimately, the most successful compliance strategy will be one that is created with a clear understanding of what processes are already in place—and how that approach may be steering a hospital down the wrong path. Miller recommends evaluating existing policies to identify where they deviate from the Medicare Claims Processing Manual as well as how they impact compliance with the three-day rule.